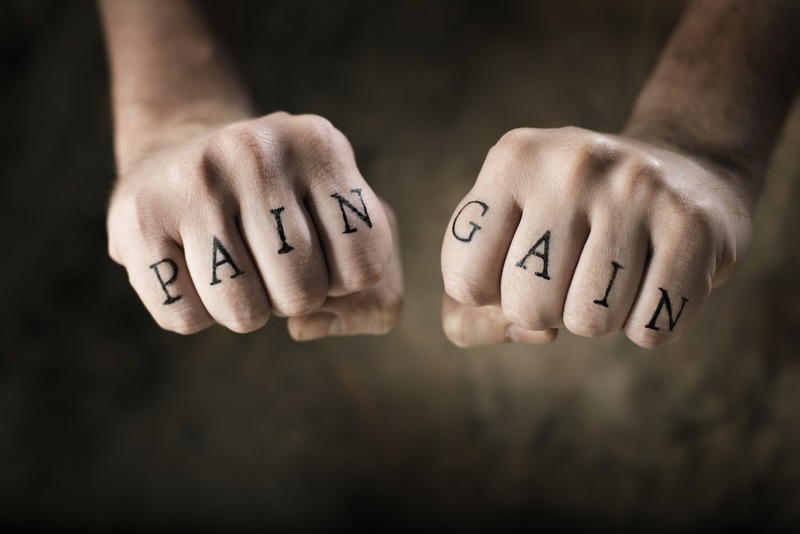 Do you know the saying, “pain is gain”? Well, if you don’t, the basic meaning behind it is that if you’re hurting while trying to increase muscle mass, chances are, it’s a good thing. The pain from the workouts will bring you muscle gains. However, that’s not always true. There are times when hitting the gym too hard can be dangerous. If you’re experiencing pain while lifting, harmful side effects may ensue. If that’s the case, and you’re feeling more pain in certain areas of your body, you need to calm down with the heavy workouts, or rest up for a few extra days before continuing. The number one issue with feeling pain during workouts is that men think it’s good. Most men will actually try to fight through the pain; This will cause problems. Put down the weights and walk away. Lifting weights is not supposed to cause pain, at all. This statement has nothing to do with the soreness you may experience that day, the next day, or the next; It only has to do with actual pain. You’ll know it when you feel it. And, if you don’t stop lifting for a little while, or if you don’t adequately rest in between workouts, you may cause severe trauma to your muscle tissue, in turn leading to joint and cartilage problems. But I’m here to help. Here’s a few painful side effects that may happen when lifting. If they do happen, stop lifting, rest up for a few days, ice the areas, and maybe even take a few anti-inflammatory medications. If none of these options work, make an appointment with your primary care doctor as soon as possible. 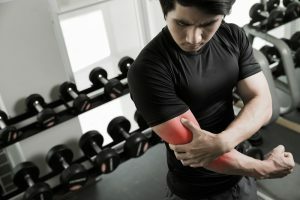 Elbows are not supposed to ache or burn during workouts or lifting. However, if this does happen, it’s quite possible that your “tennis elbow,” or lateral epicondylitis, is having issues. If left unchecked, or if weight lifting is continued, “tennis elbow” can greatly affect you. Unfortunately, if you keep lifting with such a problem, you may be unable to lift, grip, or move the lightest of objects. Do not go back to lifting until the pain is nearly gone. Once the pain has subsided, get back into the swing of things slowly. Remember, “tennis elbow” tissue is surrounded by tendons, this meaning that your tendons have to fully heal and be brought back into work outs slowly to ensure a full recovery. Some muscles in the upper arm may have been affected, too. For this, be sure to slowly ween your way into strengthening exercises. Back pain is no joke. To further this fact, back pain is no joke especially when it tends to shoot unbearable pains down either of your legs (also known as radiating pain). This type of pain can also provide the body with numbness or pins-and-needles in the legs. If any of these symptoms are taking place, it’s likely that something is off balance or damaged in the spine, or that a nerve was greatly affected. Squats and deadlifts are the most common exercises to bring on such pain. However, such pain will not come out of nowhere. Chances are, the person doing such exercises is lifting too much weight when exercising and needs to tone it down a notch. If deadlifting is your favorite exercise, or one that you do very often, be sure to prepare yourself so that you don’t have to go through such pain. Make sure your glutes are warmed up and your core is entirely engaged before picking up the weights. But, if the pain persists, or if the pain continues down the leg and into the knee, foot, toes, etc., go to your doctor as soon as possible. Pain in the knee is likely to happen due to exercises like squats and lunges either being performed the wrong way or being performed with too much weight (if weight is added). And, if the exercising is being performed incorrectly, such as twisting and turning in the wrong directions or ways, there is a high possibility for injury or pain to follow. For example, pain on the inside or outside of the knee can generally point to an injury of the meniscus. If the knee is popping in and out, or a cracking noise is hurt when walking or exercising, this can conclude that it is most likely a meniscus injury. However, if the pain is extremely unbearable accompanied by severe swelling, the injury may be worse than just meniscus problems. Here is where you’ll want to seek medical attention. It is recommended the stop the exercise that is causing such knee pain immediately. Also, for future reference, make sure you are performing each exercise the right way and that you are strengthening muscles in your body like your hamstrings and glutes to support your balance when working out. Shoulders should not make a clicking noise while working out. However, if they are making such a noise, it’s likely that they are either inflamed or experiencing arthritis. Other signs and symptoms of similar shoulder injuries consist of pain and weakness in the shoulder. When either of these arise, the injury in question is either rotator cuff pain, or pain of the tendons. Tears in tendons may soon follow if exercises are maintained. Most of these injuries need medical attention. After the problems are fixed, avoidance reoccurring issues is simple: Be sure to balance yourself the right way while working out and make sure you don’t put too much pressure on yourself. Stretching before and after workouts is a key aspect of maintaining a proper workout, especially when it comes to shoulder exercises and the pain that may accompany it. Also, making your lower back stronger with a select number of lower back exercises is always a good recommendation to take into account. Hip or groin pain is not fun to go through, but then again, no pain is fun to go through. When hip or groin pain is in effect, it is typical for a clicking or a locking sensation to occur. If such pain does occur, however, it is best to seek medical attention as soon as possible, considering that certain cartilage near your hip or groin bones could potentially be lacking the lubrication it needs to function properly. While such pain is taking place, and in the surrounding days afterwards, it is recommended to stay away from exercises such as squats and lunges. Resting muscles for a few days while taking anti inflammatory drugs is the best medication for such an injury. Being sure to balance yourself correctly during exercises always helps.